When you order a kit, make sure to order the one your really want! already have them. If you need them you can order them on the supplies page. For those of you who have already purchased the pattern. You save $8 off the complete kit price and a lot more from not having to puchase tons of extra beads for one project!. Got more beads than you know what to do with? Order just the pattern and use up all those Size 11/0, 8/0, 6/0 seed beads, new fun Czech Twin Two Hole Beads, Super Duos, 6mm Rounds/Crystals/Pearls and 4mm Rounds/Crystals/Pearls! Easy and elegant using classic chevron/netting techniques and 4mm and 6mm Glass Pearls, 4mm Fire Polish Crystals, Size 11/0 and 8/0 seed beads. Create this beautiful collar necklace. Kit makes up to a 22" necklace. Comes in five great color combinations. Talk about royalty. This necklace though similar to Delilah, has more sparkle and a bolder presence. Using the Chevron/Netting stitch, it's a simple neclace to make, yet it looks complicated. 4mm Fire Polish Crystals for sparkle, 6mm Glass Pearls for a touch of elegance, put that together with the Size 11/0 and 8/0 seed beads and magic happens. I love how this collar necklace looks on. I have to make another one for me so I can wear it! All my samples are on my display board! Wondering what to do with that one large decorative button that you just had to have?Turn it into a one-of-a-kind necklace! Learn how to do branch and loop fringe to accent your button. Several different ideas and instructions for necklace desgins and even more on how to add additional embelllishments are incuded. Different ways to anchor the button, keep it stable and not flipping are all great tips included in the detailed instructions. These make the perfect gift for the person allergic to metals. There are so many fantastic glass buttons out there. Check out the buttons on the Accessories page! The perfect focal bead for a necklace, easy and fun to make! You'll be using Right Angle Weave. You will learn the basic shape and then how to add to it to make an even more elaborate design. These are beautiful by themselves on a chain or with multiples on a necklace. Swaravski Crystals to create these fun baubles. Big, bold, and sparkly! These beads are fabulous with the classic Hollow Crystal Bead designs to make into a show stopper of a necklace. Use one or make multiple beads in different colors for a great necklace that can be worn with multiple outfits. You will need Size 11/0, 8/0, 6/0 Seed Beads, 8mm and 6mm Fire Polish Crystals, Druks, Stone or Swaravski Crystals to create these fun baubles. This bead stitch creates a soft and flexible bracelet or necklace reminiscent of a crocheted rope. But on this project you don't have to string all your beads in advance, you add them as you go. You can vary the size of beads and the shapes to create many different looks. For your first project just choose three colors of Size 8/0 seed beads and button for your closure. Once you become more advanced you can change the size of the three colors for a more dynamic twist for a completely different look. 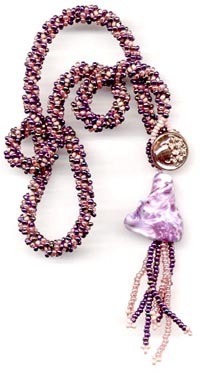 The spiral rope is a great bead stitch to use for a nice soft flexible necklace. You can use many different kinds of beads and shapes to create an infinate number of variations that all look different and yet are the same stitch. You'll need at least two colors of Size 8 to learn the stitch, then go crazy! Experiment away, it's only thread if you have to cut it apart! As with the sample shown to the right, instead of just two colors of beads, she used three colors PLUS fresh water seed pearls, her own lampwork bead and a Czech glass button to create this beauty.